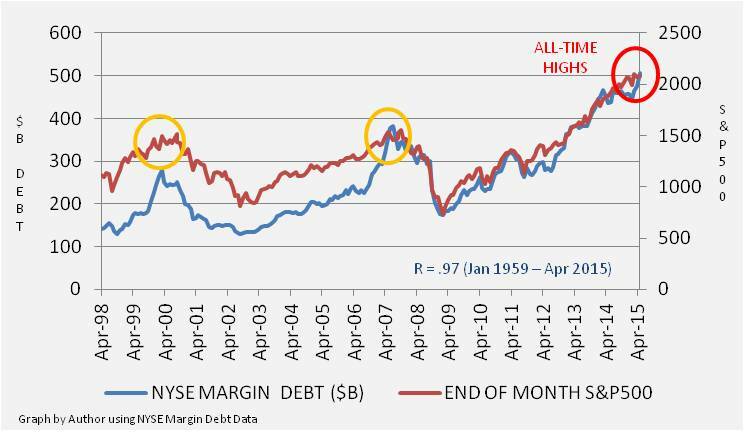 Margin Debt Reaches New All-Time High – Bullish or Bearish? Money used to margin stocks on the NYSE grew to $507B in April 2015. (see NYSEData.comFactbook: Securities margin debt) Looked at in isolation, you might interpret the continued inflow of leverage to buy market assets as a bullish indicator. Investors are confident in the future, therefore why not take cheap money and buy assets that seemingly just continue to rise. The temptation to rationalize that margin activity is a positive indicator for stocks is a function of how highly correlated the level of margin debt and the major stock indexes (SPY) (DIA) have been over the past 50 years. 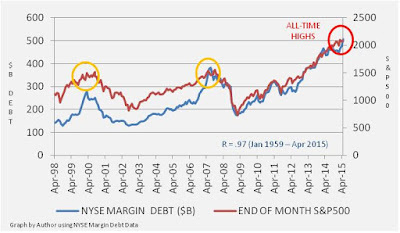 As shown in the graph below, the correlation factor between the NYSE margin debt and the level of the S&P500 is .97, almost a 1 for 1 correlation through time. Correlation does not imply causation, but if interpreted relative to the situation, the riskiness of the amount of leverage being taken on by the market can be an important indicator. For example, in both 2000 and 2007, the NYSE also set new all-time margin debt levels as the stock market set new all-time record highs for that point in time. History shows that these were unsustainable high water marks for the stock market, and the ensuing break-down in stock valuations lead to a death spiral exacerbated by margin calls. As market leverage continues to move to new highs, will the market continue to grind higher or are we about to experience another breaking point?